For various research and development projects, you may also visit our research group meetings webpage or the research internship webpage. Spintronic effects, in particular the spin Hall effect and its variants have ushered in a new era of low-dimensional materials and the burgeoning field of spintronics which aims at carrying out information processing tasks reliably, efficiently, and robustly. One of my projects involves the optical probing of spin caloritronic effects notably the spin Seebeck effect. 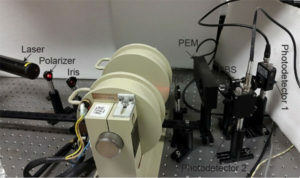 The proposed optical read-out obviates the need for electronic measurement which relies on spin injection across interfaces. 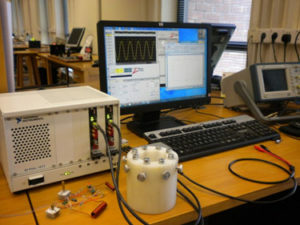 The readout is being performed by a scanning Kerr reflection technique while time resolved dynamics of the spin current are probed by a high bandwidth, pulsed laser, yielding vital information about the time dynamics of spin transport, and hence the “benchmarking” of spintronic devices. As part of this work, we are investigating the magneto-optic signature of topological insulators. Singe-molecule magnets (SMM) are organometallic molecular complexes that behave as magnets. They are distinct from single-crystal, bulk and single-domain magnetic nanoparticles in several respects. Their unique properties position them at a special vantage point, straddling the interface of classical nanophysics and quantum physics. I am working on the probing of thin films and solutions of such SMM’s using polarized light that is obtained from a stabilized and modulated laser diode. The measurements are performed inside a variable temperature cryostat and are carried out in transmission or reflection geometries. These studies may become useful for exploring the potential use of SMM’s as magneto-optical switches, giant Faraday rotators, magnetic field sensors and futuristic quantum information processors. Preservation and spatial transfer of spin order in endohedral hydrogen fullerenes.